Looking at the product that was ultimately built, their extravagant ad copy may be seen as over-the-top in context of other neighborhoods in the city, as the designs in Alta Vista are one of the more restrained examples of mass-produced mid-mod design by a merchant builder, most notably lacking the huge amount of glass that other builders later included in their offerings. Part of this may have been because they were one of the first merchant builders in the Denver area to commit to a mass-produced contemporary product, with only a couple of other builders taking the leap that summer. Krisana Park, the Cliff May Homes, and others wouldn’t hit the market until much later that year into early ‘55. The other strong possibility though is that Hoskinson Bros. knew their buyers better than others, and intentionally walked the line between the new and the familiar . . . new details including long and low massing, low-slope roofs, open living areas, vaulted ceilings, integrated carports and covered patios, exposed main beams, and more . . . yet familiar with traditional brick and siding exteriors, a traditional window placement and sizes, traditional placement on the lot . 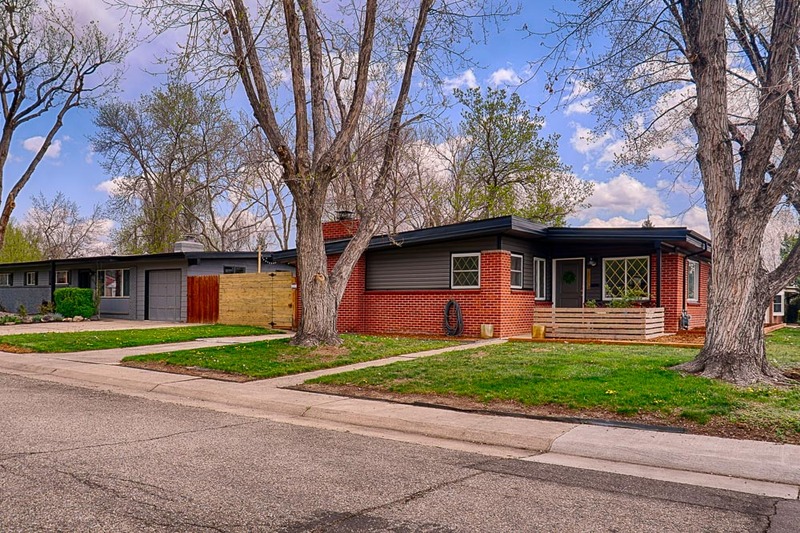 . . and really no attempt to create the indoor-outdoor connection that proved so vital to the design of homes in Krisana Park, Harvey Park, and elsewhere. 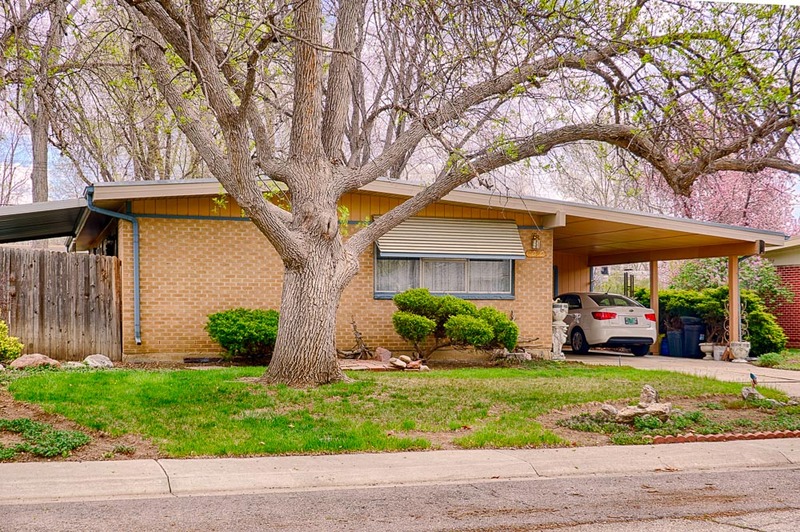 Whether intentional or not, it seems that this more restrained design aesthetic was successfu in the 1950sl, as Alta Vista is the single largest enclave of mid-century modern homes in the city, based on number of homes, with over 235 built. There was some infill with other traditional designs, but the neighborhood predominately consists of contemporary homes. Alta Vista Today . . .
Alta Vista has fared relatively well through the years and remains mostly intact, but includes a typical amount of blight and insensitive renovation for the area. There have been several restorations in recent years, and there appears to be a willingness to invest in the neighborhood. 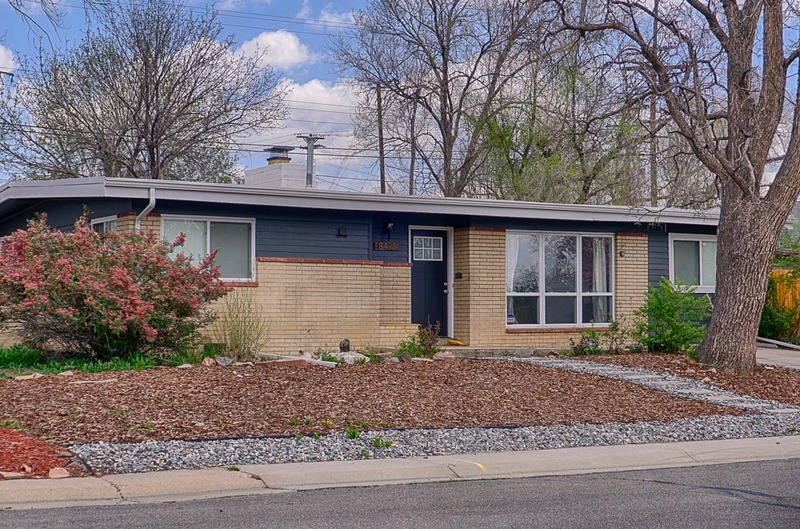 Because of the large number of houses, homes in Alta Vista come up for sale relatively frequently, and because of the restrained designs, buyers will find homes here much more affordable than in other mid-century modern enclaves in the Denver area. Some homes still retain their original birch cabinets in the kitchen, and assuming you have no desire to change the kitchen footprint to open it up the the rest of the living area, these cabinets are an asset to the house and should be retained and restored, where possible. Stained wood veneer doors should be restored and kept as well, with new to match, and as with virtually all mid-century modern homes, paneled cabinets doors and paneled interior/exterior doors should be avoided. 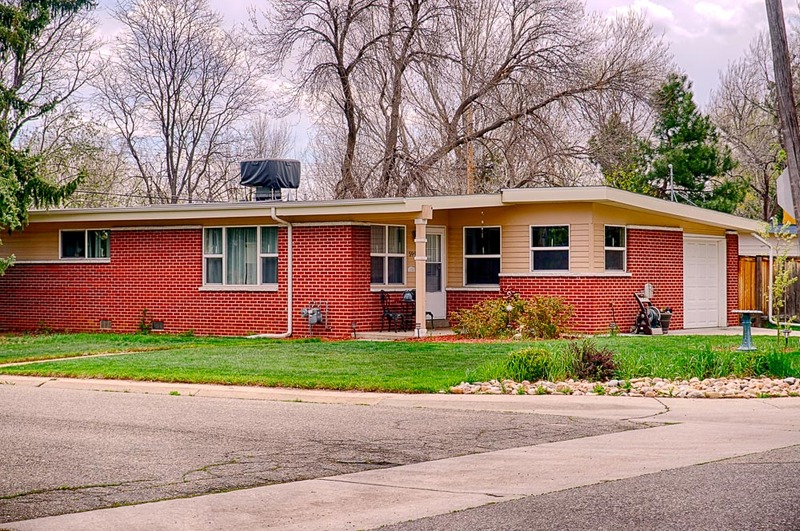 For larger renovations or additions to a house, Alta Vista benefits from having been the focus of a Pattern & Design Idea Book for Post War Homes assembled by Historic Denver, the Colorado Center for Community Development (University of Colorado, Denver), and the City of Arvada. As a result, residents have a resource they can refer to with recommendations specific to a couple of the Alta Vista Models, but which could be applied similarly to any of the mid-mod models in Alta Vista. Alta Vista is located in the Denver suburb of Arvada. Navigate to the intersection of 61st Avenue and Carr Street, and you will be on the east side of the enclave. The Hoskinson Bros. ran many over-the-top ads for their Alta Vista project . . . here are just a couple examples! 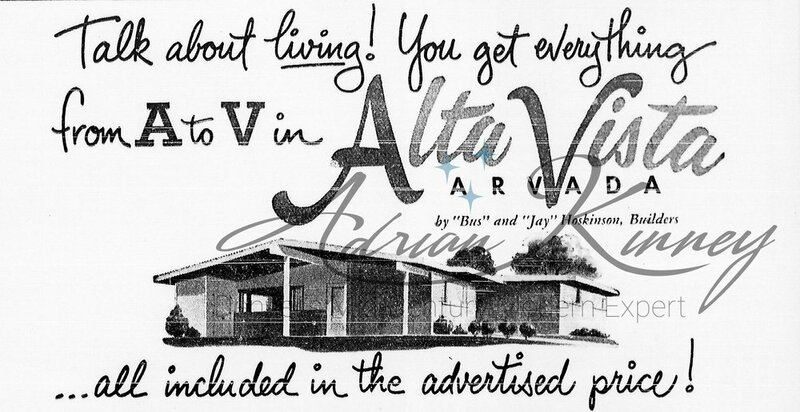 Reproduced from an Alta Vista advertisement, September, 1954 . . . the Alta Vista alphabet, from A to V! A is for Alta Vista . . . a complete suburban community of new contemporary homes by Hoskinson Bros. L is for Lighting . . . Silent Switch lighting which is part of the luxury touch you’ll find in your new Alta Vista Home. B is for Barbecue Pit . . . and it’s ready for outdoor meals the day you move in. M is for Mountain View . 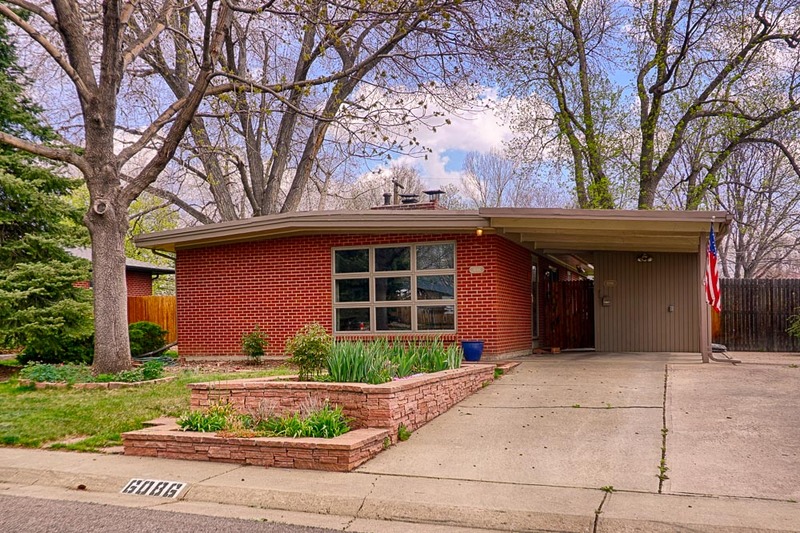 . . and Alta Vista’s location offers you one of the most majestic in the Denver Area. C is for Choice . . . your choice of 8 floor plans . . . brick . . . tile . . . linoleum . . . paneling . . . doors and colors. N is for Number One Oak Floors . . . warm rich hardwood flooring which characterizes the quality construction of your Alta Vista Home. D is for Denver Busline . . . which regularly runs by Alta Vista and takes you to downtown Denver in minutes. O is for Outdoor Living . 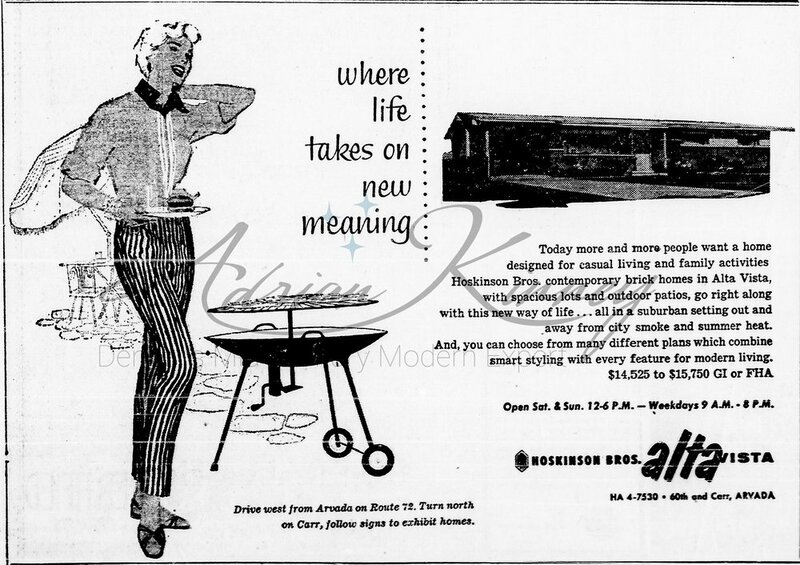 . . patio, charcoal, barbecue grill, outdoor incinerator, even the clothesline umbrella . . . in and yours in Alta Vista. E is for Extra . . . extra features that are actually in your Alta Vista Home when you buy it . . . not tacked on later. P is for Pride . . . and you’ll be proud of Alta Vista . . . where every home is distinctively different. F is for Fencing . . . your yard is completely fenced in beautiful redwood and chain link steel, giving you beauty, privacy, and safety. Q is for Quality Construction . . . backed by Hoskinson Bros.’ written warranty on materials and workmanship. G is for Giant Picture Windows . . . which look out to the Rockies from your living room. R is for Roof . . . colorful “Desert Natural” built-up gravel roofs with a 15-year guarantee. H is for Heat Conditioning . . . the nationally famous Coleman Blend-Air System. S is for Spacious Living . . . big suburban lots. Spacious wardrobe and storage closets with Glidall doors in all Alta Vista Homes. I is for Imaginative Design . . . in 2, 3 and 4-bedroom models with 1050 to 1400 square feet of living space. T is for TV Antenna . . . a unique built-in feature in Alta Vista Homes . . . yours at no extra cost. J is for “Junior” . . . your children will love Alta Vista . . . close to all schools, with lots of room to run and play in safety. U is for TV Utilities . . . Arvada city water (no restrictions), Denver gas and electricity. Streets, sidewalks, and sewers in. K is for Kitchen . . . Youngstown Steel Kitchen with generous cabinets, Formica tops, and kitchen exhaust fan; plus a Waste King food disposer. V is, of Course, for Victory! . . . Your vistory over humdrum, cooped up living and high rent when you enjoy life in Alta Vista.